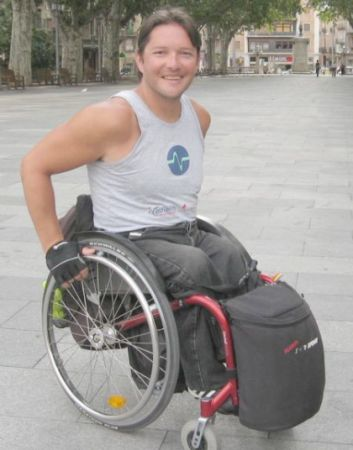 Vasile Stoica is the first Romanian to have traveled around the world on a wheelchair. Born paralyzed from the waist down, he spent the first thirteen years of his life mostly in hospitals, enduring numerous operations which were supposed to enable him to walk, too poor for a wheelchair, forced to drag himself along the floor. When he got into his first chair, it felt like flying to him. Since then, he’s set ever higher goals for himself. He started making trips through Europe, then prepared for his trip around the world. He completed his first round-the-world journey in 1998, and that’s also when he entered the record books as the person who traveled the longest distance by wheelchair. Since then, he plans different routes and travels with his special Kuschall wheelchair each year, hungry for new places and new challenges. 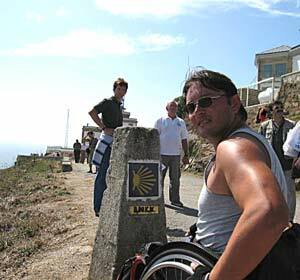 Here he is after he completed a grueling 5,250 km trek across Europe, in 2006, at Finisterre, Spain. The man who traveled the world by wheelchair doesn’t get any respect in his own country, along with the other disabled people who live there. In a short video that he and his friends put together, he demonstrates how hard, or even impossible, it is for him to get around on his wheelchair in Romania, because of the lack of disabled access to public buildings, such as ramps or elevators — this in spite of laws that have been on the books for years. Photos used courtesy of Vasile Stoica. The first people to have traveled the world by wheelchair were Patrick and Anne Simpson, who published their account of the journey in 1997, in a book entitled simply “Wheelchair Around the World“. Next Post Perhaps some PSAs on manners are in order?